Breathing Room is the story of Evvy Hoffmeister, a 13-year-old girl who is placed at the Loon Lake Sanitorium for tuberculosis in 1940 in Minnesota. The author grew up in Rochester, MN and her father was a pediatrician at the world-renowned Mayo Clinic there. Her feel for the area and the topic are evident in the genuineness of Evvy’s voice. With short quick chapters Evvy guides us through her time at Loon Lake from fear and loneliness to friendship, love, loss and healing. Because the novel takes place right before the US enters World War II Evvy’s story is tinged with the atmosphere of mistrust and sadness that hung over the entire nation at the time. Evvy (whose last name, again, is Hoffmeister) says that it was “not a good time to be German” and, later, another patient reveals to Evvy how she has had to hide her heritage in order to come safely to Loon Lake as well. It is realistic for the national unrest of the time to swirl around the knees of Evvy’s story without ever taking a main role in the plot; that is what it would be like for these young girls without political ambitions or understanding. Evvy’s relationships with her father and brother are sweet and reassuring, Her fears that her mother may not even like her are often echoed by many children. The way in which Evvy and her mother are able to connect in an unlikely, roundabout way through poetry is a nice subplot. Like all stories about people suffering to survive through life-threatening diseases Breathing Room takes us on a roller coaster of emotions. In this case Hayles does it with a gentle compassion interlaced by those small moments of joy among friends–those contacts we make in the loneliest stretches of our lives. I expected to suffer through Breathing Room because it is a Lovelace Award Nominee and as such I felt obligated to read it. I remind young readers to be open to reading books to which they may not initially be drawn on their own. Trust another reader, a teacher, a parent, a friend…and just try it. Sometimes I forget to follow my own advice and once again I have a renewed commitment to trying books I would not personally have plucked off a shelf to read! The Author’s Notes following the story detailing Hayles’ research into the tuberculosis pandemic were fascinating to me in both information and the author’s personal experience. Hayles tells us that when the cure for tuberculosis was discovered these sanitoriums closed almost immediately and the stories of the people who lived there were lost in an instant. 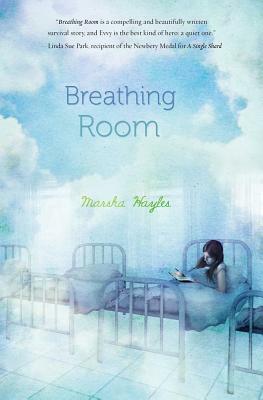 In Breathing Room Marsha Hayles “hoped to give those forgotten girls a chance to breathe again.” And she has. Breathing Room was a reading experience that both taught and moved me: Evvy affected me, made me smile and now shares the place in my heart that is filled with characters who have touched me.